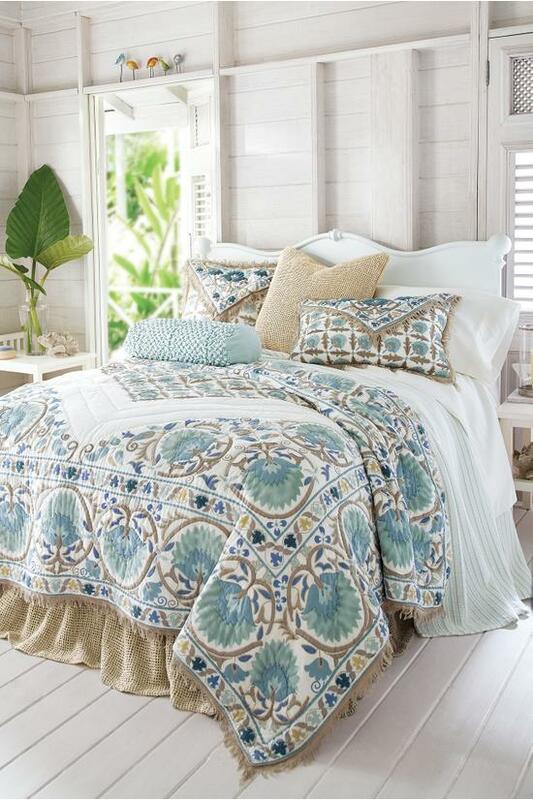 Inspired by the lush, magnificent gardens of Morocco, this Jardin Maroc Quilt is elegant and easy-going, sophisticated and sumptuous in a palette of restful blues and greens mixed with soft earth tones. 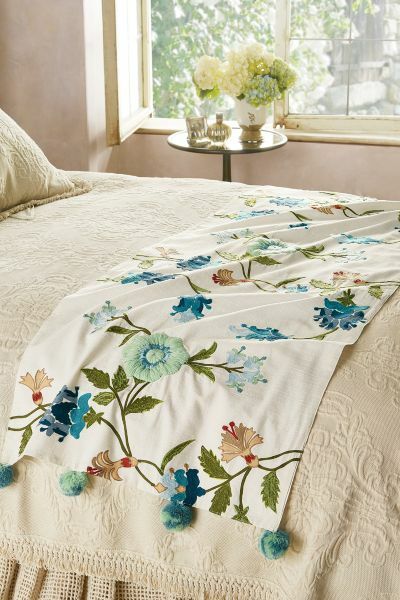 Stylized florals both large and small play with proportions, while embroidered accents add rich textural dimension. Tailored from pure cotton, it’s framed with raw-edged fringe on three sides. $239.95-$259.95. Buy here. 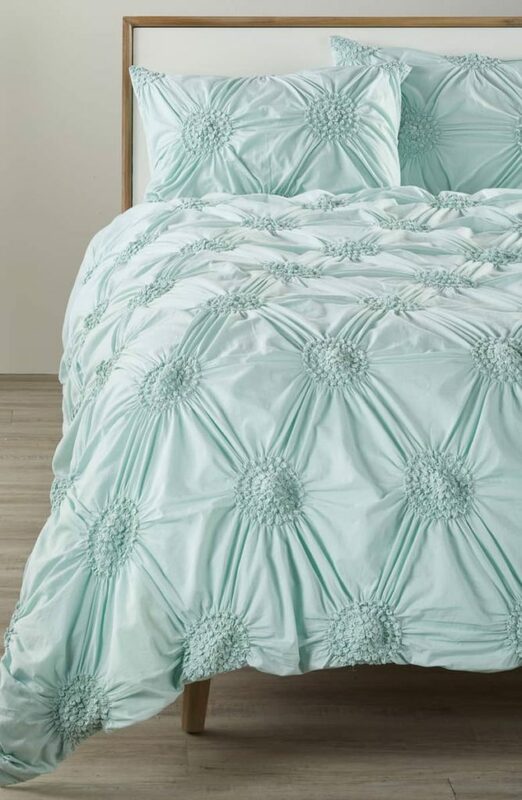 Made from dreamy cotton voile in a choice of versatile solids, this shabby-chic Chloe Duvet Cover is beautifully textured with a gathered and tucked medallion design. In Teal Surf. $199-$229 Sale $69.65–$80.15. Free shipping. Buy here. 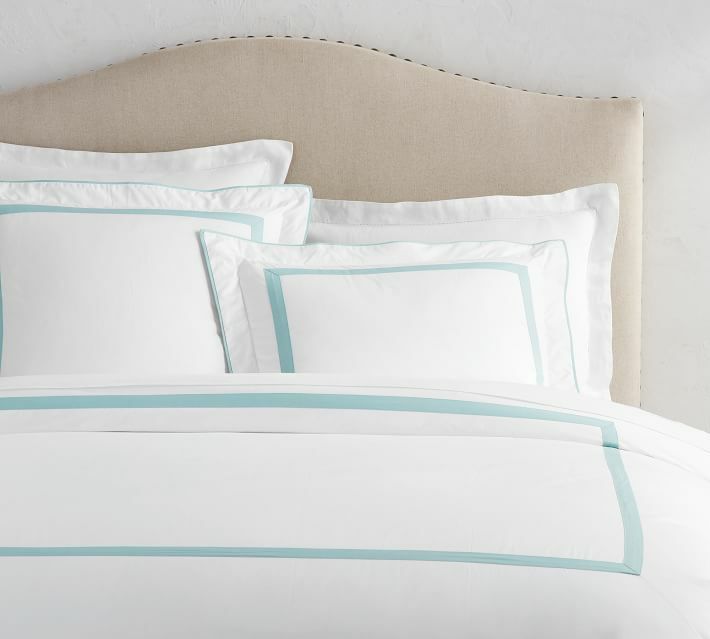 Making a hotel-worthy bed has never been easier than with the Morgan Organic Bedding in Sea Glass. It’s tailored with flat embroidery and a slim mitered border – a handsome frame for an embroidered monogram. 100% organic cotton. $49.50–$249. Buy here. 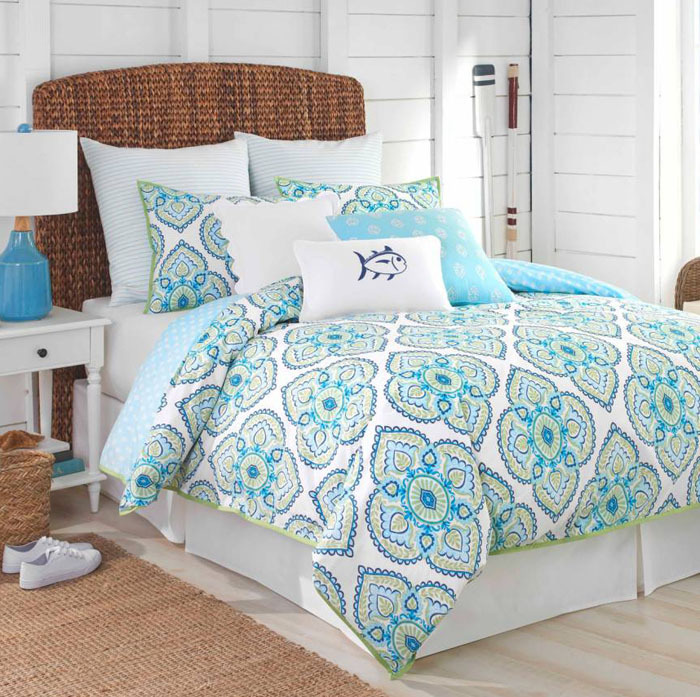 A swirling, vivid print adds bright bohemian appeal to this delightful reversible Calliope Quilt stitched in pure cotton. $99-$129. Free shipping. Buy here. 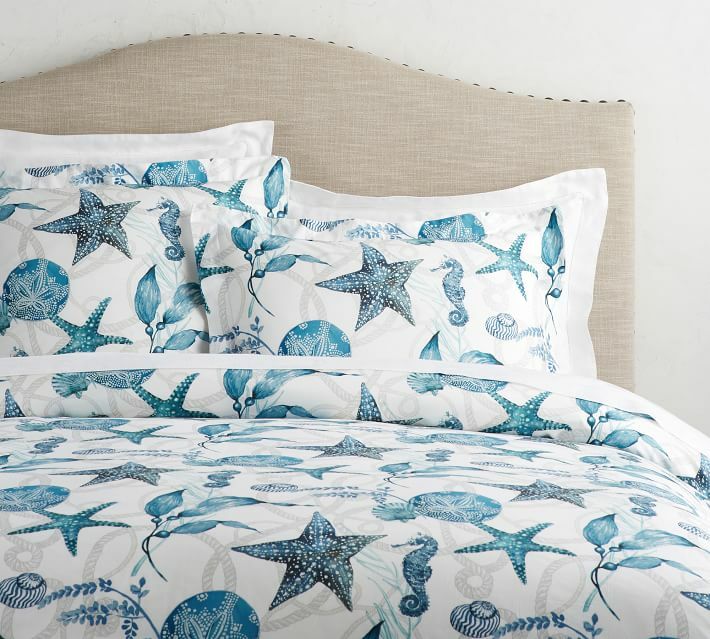 This Catalina Coastal Duvet Cover & Sham blends a palette of coastal blues with playful sea creatures. Made of 100% cotton. $29.50–$129. Buy here. Inspired by the intricate ironwork found on decorative Spanish gates and windows, this Somerset Matelasse Coverlet in Resort Turquoise is elaborately patterned with large damask medallions. Framed with a border of hand-tied fringe, this extra-special layer brings sumptuous texture to the bed without overpowering the decor. Woven in Portugal of soft cotton, laundering will enhance its graphic beauty. $159.95-$219.95. Buy here. This Camila Bedding Collection from Sky features tufted details on the duvet and rich patterns that will infuse an exotic aesthetic to any bedroom. $70-$270 Sale $49.99-$189.99. Buy here. Featuring a special dyeing technique that makes each piece subtly one of a kind, these Belgian Linen Fiber Dyed Duvet Cover + Shams are woven from fine threads of Belgian flax that’s washed for a luxe, lived-in look. 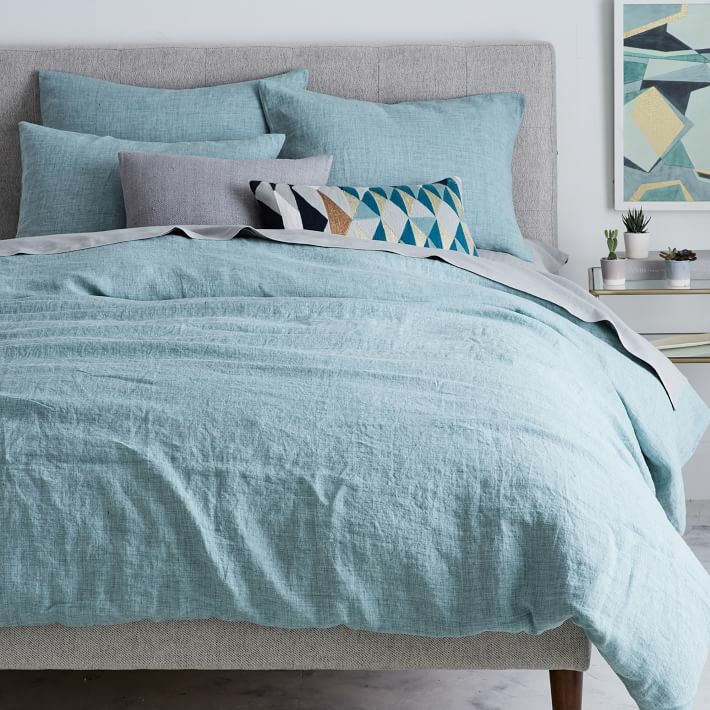 Prized for its breathability and softness, linen keeps you cool in the summer and warm in the winter, making it the natural choice for the master bedroom. $44–$249. Buy here. 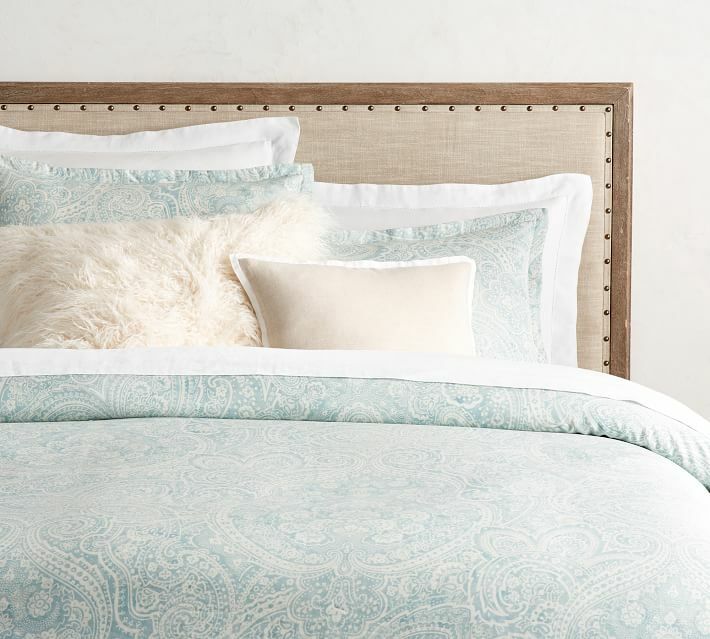 The silky shimmer of this Vanessa Printed Tencel Duvet Cover & Sham is perfectly matched by its soft color and dreamy paisley print. Breathable and sustainable, natural-fiber TENCEL is a great option every night of the year. $29.50-$129. Buy here. This Island Aqua Collection was inspired by a gorgeous linen tea towel. Made from 100% linen. $310.50-$379.50. Buy here. There’s nothing better during the summer than beach days and ocean breezes. 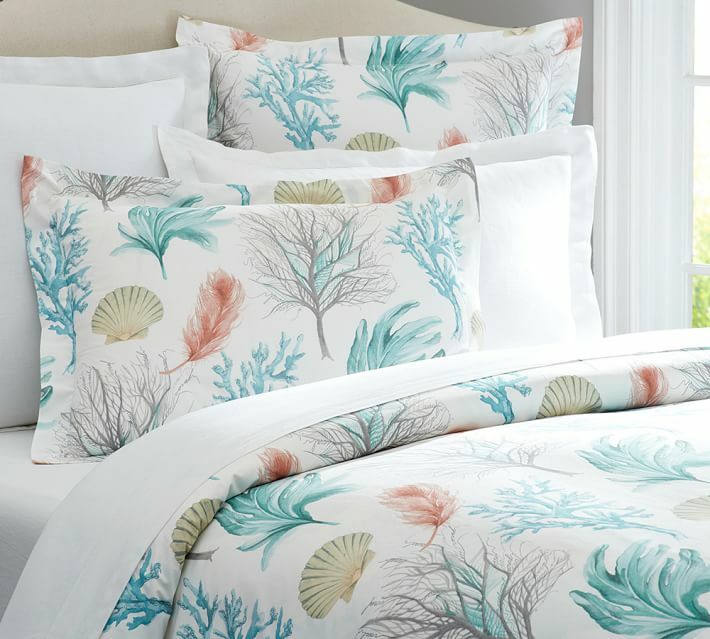 This Del Mar Coastal Duvet Cover & Sham makes a coastal style update to your bedroom with a hand-painted print at an amazing value. $49.50–$179. Buy here. 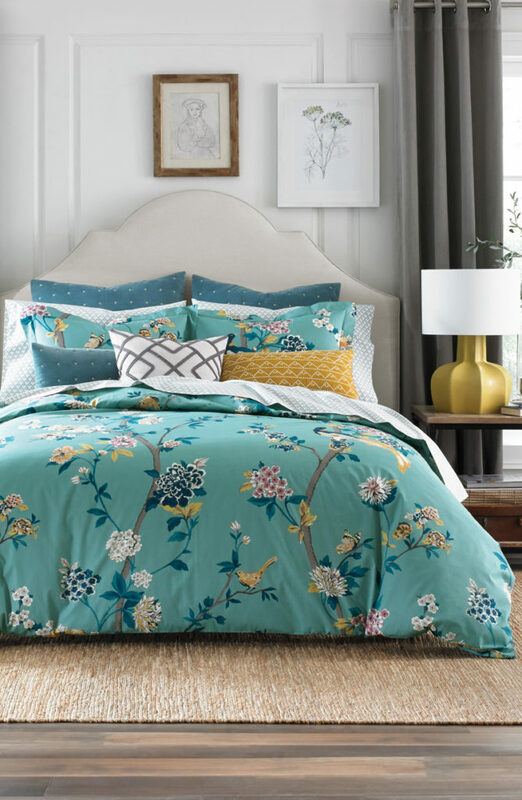 A modern take on chinoiserie, this soothing scene of flora and fauna awaits you each night on this smooth cotton DwellStudio Juliette Bedding Collection. 100% cotton. $199.99–$229.99. Free shipping. Buy here. 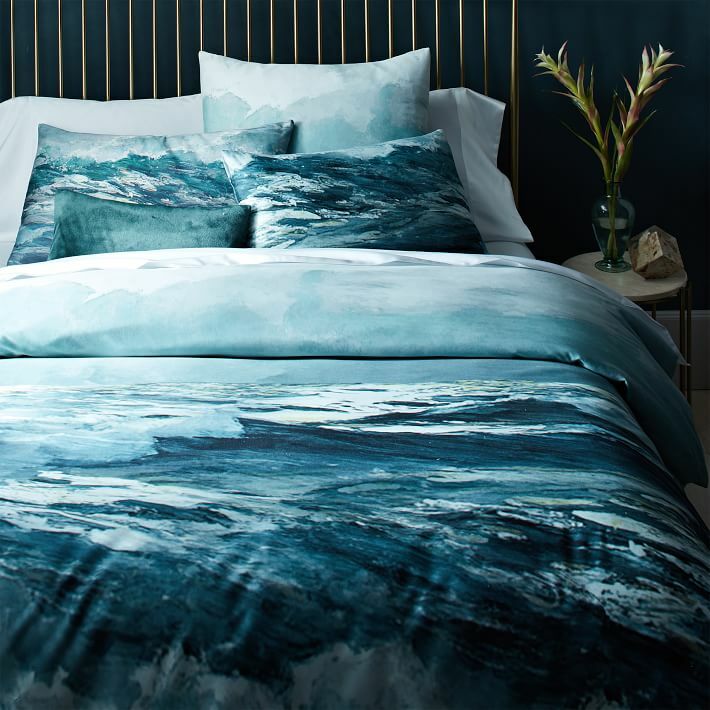 Inspired by oil paintings of the ocean, this Organic Oceanscape Duvet Cover adds a serious splash of color to your bedroom. 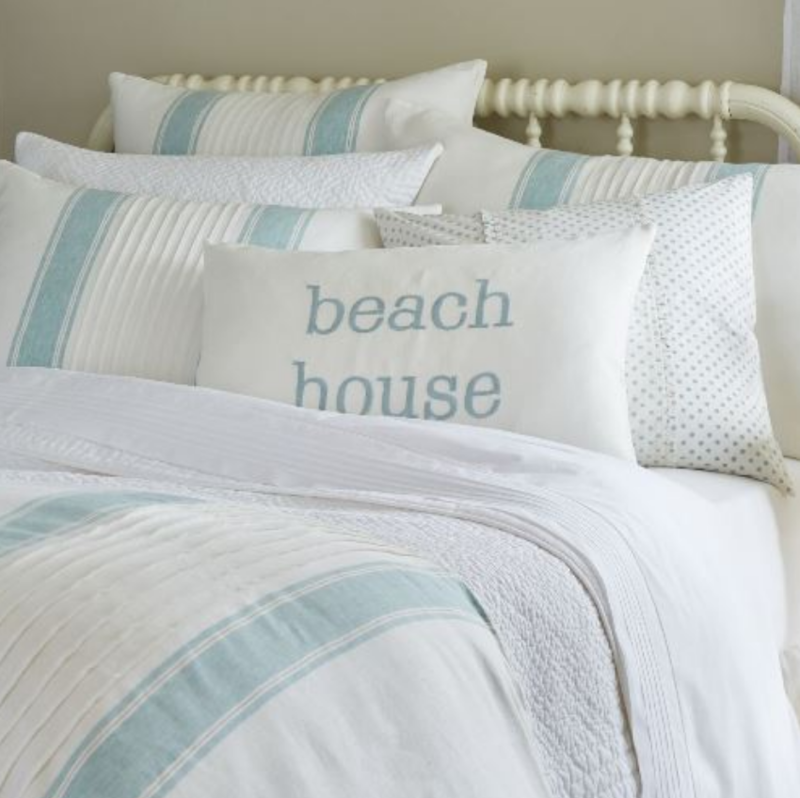 Each one is printed on 400-thread-count organic cotton for bedding that feels just as great as it looks. $29–$149. Buy here. 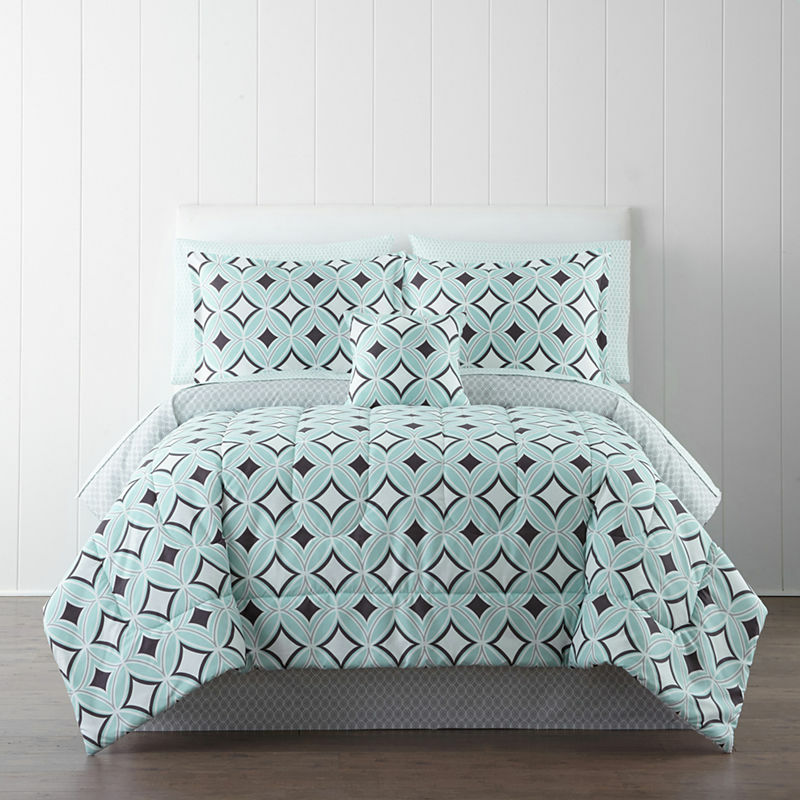 Made of soft microfiber polyester, this Studio Premiere Bedding Ensemble features an updated geometric print for a fresh, modern bedroom. 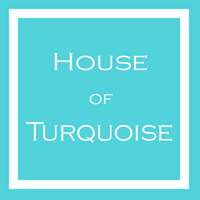 Reverses to unique pattern on both sides in shades of bright teal and tonal grey color. Includes comforter, sheet set and bedskirt. $110-$130. Buy here.